The video below shows a typical day in the life of Suzanne Perazzini who has IBS-C and has managed to control her symptoms with the low FODMAP diet. Suzanne is a nutritional therapist that specializes in IBS and the low FODMAP diet. Suzanne offers some very helpful information in this video for both IBS-C and IBS-D sufferers and provides hints on how to plan your daily meals. She breaks down how she prepares her breakfast, lunch and dinner meals and two snacks. These five small meals in the day help to keep you full for longer, provides constant stream of energy and you are able to help minimise IBS symptoms. The breakfast is an easy to prepare oats with fruit, yogurt and a side of vegetables. Accompanied with this is a cup of normal tea but milk or water is preferred. After breakfast there is a tasty snack of chicken, vegetables and an oat biscuit. 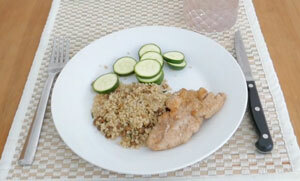 Lunch is another fulfilling meal with chicken, quinoa and zucchini. The afternoon snack is some cheese, salad and a low FODMAP cookie. 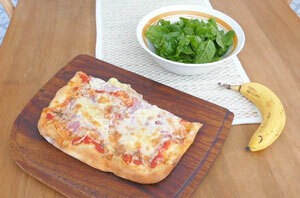 The final meal, dinner, is a FODMAP friendly pizza accompanied with a salad. Suzanne is careful to ensure she meets all her nutritional goals including the right amount of protein, fiber, calcium and her 5 vegetables a day. For those who are lactose intolerant she offers suggestions on what to substitute. Below the video you can find a transcription with timestamps so you can fast forward to any places of interest. There are some lovely and tasty scenes of each meal that shows how delicious and colorful we can make our FODMAP friendly meals. 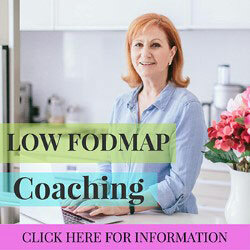 Suzanne provides a wonderful personalized FODMAP meal plan service that provides you with a custom 7 day meal plan with easy to prepare recipes. Other goodies are included such as a daily diary sheet and a comprehensive shopping list. Welcome my name is Suzanne Perazzini and I’m a low FODMAP diet coach and I’ve helped thousands of people implement the low FODMAP diet but today I’m just going to walk you through a day in my life because I have irritable bowel syndrome as well as you if you are watching this. We’re going to start today with breakfast. So I have irritable bowel syndrome with constipation. You may have it with diarrhea and might have to have a slightly different breakfast to me. But because I have the constipation side I need to get some good fiber in throughout the day without overdoing it because we know that fiber is a gut irritant and can certainly tip you over the line of symptoms into symptoms of bloating, gas, etc. If you have a tendency for the diarrhea side it could increase your diarrhea. So I’m going to have oats. Now I’m not going to have any more than a quarter of a cup of oats. That’s to be absolutely safe from a fiber side and also from a FODMAP side. So I’ve got my oats here and because I’ve been doing this for many years now I don’t actually measure anything but I just take a couple of dessert-spoonfuls and put them into a plate like that. Now if you have the diarrhea side perhaps you could have some cornflakes but just perhaps choose from a health store and make sure they are sugar free or with a little bit of sugar and is additive free as possible. The fact I have constipation side I’m also going to have a dessert-spoonful of chia seeds. These chia seeds you can soak them overnight in water and that makes them more digestible. I would actually advise you to do that especially initially while you are trying to find what fiber levels are safe for you. 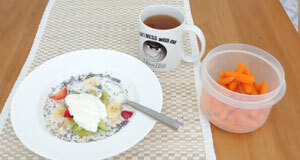 Now I’ve got my breakfast of the oatmeals and chia seeds and I’m going to put milk together with that. I don’t have to have lactose free but you possibly do so whichever milk is right for you pour that in with the oats and chia seeds. Now many of you at this point would put that in a microwave and make it into a porridge or put it on the stove into a pot and make it into a heated porridge. I actually have mine like that by the time I get around to eating it’s certainly soaked up a little bit of those milk juices and it’s much softer and even the chia seeds have soaked up quite a lot of that liquid and become more gel-like. That there covers my more starchy fiber-like part of my meal. While I’m preparing the meal because we should have vegetables even for breakfast we have to get 5 to 6 vegetables a day and it’s very difficult to get enough if we don’t spread them out through the five meals we eat. I’m not going to put vegetables in with my oats so I’m just actually going to snack on them. Some carrots, some snow peas, some celery, some cucumber, some lettuce leaves. Just some raw vegetables while i’m preparing my breakfast. I won’t do that right now or I won’t be able to talk but I keep my baby carrots in a little container like this and you’ll see those again. I’ll probably have them for morning tea. But what I do have with my breakfast is one of my two fruits a day. I’m going to have half a kiwifruit, I had the other half yesterday and half a banana. Again I had the other half yesterday. I like to do that mix, kiwifruit in particular is really good if you’ve got constipation side of things. Whereas banana is actually a little better for those with diarrhea so I balance it out with both. I’m just going to peel that and then slice it up and put it into my oats and my chia seeds. Now we do have to make sure that the banana is unripe. You will have seen that was pretty green, the skin was pretty green. I’ve always known that I wasn’t very good with ripe bananas but now of course we know that the ripe banana is high FODMAP and with a greener one we can have one of those quite safely. I’ll just take the skin off my kiwifruit. You could be having some strawberries, some raspberries, blueberries, just always check of course on the Monash app the amount that you can have. I’ll cut that up and pop that into my plate. Actually I think we have some strawberries in the fridge so I’ll maybe add in one or two of those. Sometimes my my husband gets those for his snacks. In fact here we go. I’m just going to add one we don’t want to go over the FODMAP load for one meal for fruit. Chop that off and rinse it. Slice that in. It’s always quite pretty I suppose the little bit of red in there as well. So now that we’ve got the fruit and the starchy part of the meal and we’ve got our vegetables here we need some protein and the milk does constitute part of the protein but I’m also going to add some yoghurt. Again I don’t have to be lactose free but I still choose a yoghurt that is completely sugar free and additive free. I just put a good dollop, you could put more than that if you like but this in fact the ingredients of this is just cows milk and live yoghurt culture. Those are the only ingredients in it. That’s what you should be looking out for. Don’t get any of the yoghurts with sugar in them often even in a little pot you can have up to a tablespoon of sugar in there and that’s really going to be counterproductive especially if you are having fruit as well. Also don’t get fruit yoghurt because then they always put sugar in it even if it’s one of the fruits that we can eat. Put your fruits separately as I have and have the absolutely plain yoghurt together with it. So that is my meal that’s going to be my breakfast. Now I can have that with a glass of water, I could have a little bit more milk if I want to or I could have a cup of normal tea. I do allow myself one cup of normal tea a day. We know that caffeine is a gut irritant so coffee, tea are not particularly good for us and in fact they increase the motility of the gut so if you can avoid them perfect but I do allow myself to have the one a day and it’s usually with breakfast. It’s now time for my morning snack and so again I’m going to have a completely balanced meal. I’m going to get some baby carrots out of the fridge. I keep them in a little tupperware container like this and I’m going to have about four of those. You could probably have a few more but it’s more about how many calories somebody needs at the end of the day. I’ve also got some snow peas in here and because they are pretty big I’m just going to have the one. The next thing I’m going to take out of here is some chicken that I actually bought from the delicatessen. I checked the ingredients and it’s absolutely fine so I’m going to have a piece of that chicken and that’s full of protein. Now what am I going to have for the kind of more starchy part? You could either have a grain or you could have a more high carb vegetable like a potato or a pumpkin or something like that but if you don’t have anything like that perhaps leftover from your dinner last night you could have some rice crackers. In my case I’m going out of the shot right now to get an oat biscuit. That’s my oat biscuit there so it’s got no wheat in it at all. That is going to be what I have as a snack. Now I’m going to make a cup of herbal tea to go with my snack. I’ve already got the kettle boiled in here I’ve got my herbal tea and this one that I’m having is an organic lemon ginger. It’s by Hampstead Tea and it has nothing but the organic root ginger, lemon peel, lemongrass so we know that it’s low FODMAP and safe. Let’s open that up and pop it in there and pour our water on it. Many of the herbal teas are not safe because they are a high FODMAP of themselves but also often because the manufacturers put in various different ingredients which are high FODMAP like liquorice root is a classic one, blackberries, there can be various different things that they add in that don’t work for us. So there’s my snack sitting on my table waiting on my table for me to sit down and enjoy it peacefully. Herbal tea – lemon and ginger, a piece of chicken and oat biscuit, one snow pea and four little baby carrots. That will keep me going easily until lunch time. Now it’s lunch time. Usually for lunch I make sure that I’ve got something leftover from the night before. So that I’m not having to reinvent the wheel every time I want to eat. In fact I’ve got, again, it’s chicken this is just a coincidence that today I’ve had chicken for my morning snack and also for my lunch. I do have a chicken fillet that my husband made for me last night leftover so I will get that. I normally just take one of those there’s a couple of them on there. I will also get a little bit of leftover quinoa that we had. I’ll just grab a spoon. I’ll put that on the plate and then I’m going to heat that up. So my plates a little bit bigger than a bread and butter plate this time. We still have to make sure that we’re only eating small meals because the very fact of eating a big meal is going to be a problem for us. Together with that I’m going to have a little bit of zucchini. I’ll just cut off that end which I won’t eat and slice a few pieces on there. Now I could eat these raw but I’m going to heat up the chicken and quinoa so I might as well just do a quick flash cook of the zucchini. You can have up to about half a cup of that but I think that’s probably enough for me like that. Now I’m just going to put a pop a plate over that and I’m going to put the whole thing into the microwave just for a short while. I’ve popped that on for about 15 seconds. Now together with that meal I will have a glass of water. I’ll grab that now and have that ready for me and also of course we’re going to need a knife and a fork. Now I’ll get that out of the microwave. It has beeped so I know it’s ready. How quick was that? That’s taken me all of what, one minute, two minutes? And there’s my meal. It’s afternoon snack time. So about three hours has passed since I’ve had my lunch and now I’m going to have just a quick snack but it has to be just as balanced as any other meal. So I’m going to start off with some cheese. I’ve got a lump of cheese here and probably about that much would be right for me. Together with that I’ve actually just gone outside to my vegetable garden and got some lettuce leaves and a little piece of celery. You can probably see those behind me on the bench because I’ve just washed them. I’m just going to place those like that because I just pick them up with my hands and eat them whole with a little bite of cheese with each one. So now we’ve got the vegetable, the protein but we need that more starchy component again. This time I’m going to treat myself and I’m going to have a cookie. It is of course a low FODMAP cookie. I have those in here with my oat cookies that I had one of those for my morning snack. These are chocolate chip ones and I find they don’t hurt me at all. So that’s kind of my sweet treat for the day. I don’t have one everyday it’s not necessary. I could have just put some rice crackers with that and that would have worked really nicely. I’m going to have just a glass of water with this meal. 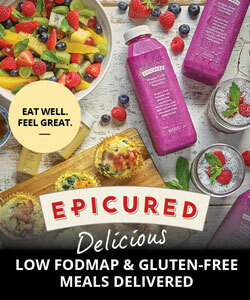 Water is our best friend, we know it’s got no FODMAPs and we can’t go too far wrong with it. So that there nice and simple is going to be my afternoon snack. Now it’s time to get some dinner about three hours has passed since my afternoon snack and my stomach’s telling me that it’s hungry. Now there is only my husband and I at home now and so we’re cooking for two. I’ve gone out to the vegetable garden and I’ve pulled together a whole lot of different salad leaves just for the green vegetable part of the meal and I’ve got that over here so you can see that there. Also yesterday I made a pizza, a homemade pizza, and we only ate half of it because there’s only two. So what I’m going to be doing tonight is reheating the other half. I’ll just grab that from the fridge now. There we go. I’ll take that out of the glad wrap and I’ll get an oven tray to use for that. On the oven tray I’ll put a little bit of baking paper, it just makes my life that much easier for cleaning afterwards. Bring that across and pop the pizza on top of it. That’s just going to go into the oven for probably about fifteen minutes would heat it up nicely and I don’t put them in the microwave because that makes it go a little bit soggy and soft on the base. So that will go into the oven which has been preheated to around 180 C that will be about 350 F. We’ll just heat that up, in the meantime I would be setting the table but we’ll speed that up just for the video. Once that’s cooked we’ll take that out, slice it up and have that together with salad and that’s a really well rounded meal because we’ve got more of the starchy side in that base which if you have an issue with the fructans in wheat you’ll be making wheat free so you could make it with a mix of rice flour, tapioca flour and perhaps potato flour, potato starch. 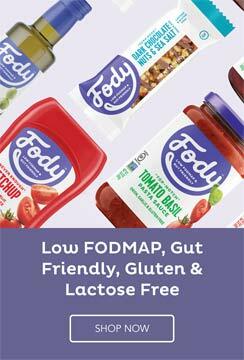 Obviously gluten free does not equal low FODMAP so not all gluten free pizza bases would be low FODMAP because they can use things like soy flour, coconut flour, almond flour etc which are high FODMAP so do make sure that it’s low FODMAP as well as gluten free. Then on the top I’ve just put some tomato from a can and then I’ll put some ham. Just make sure if possible that the ham you get is preservative free with no chemicals and because we know we have a sensitivity to the additives to the food and have to eat this fresh as possible. Then I put grated cheese over that, a mature cheese, which is low FODMAP. Also salt, pepper, some dried oregano so it’s a fairly classic Italian style pizza. I’ll bring that out of the oven now. I will transfer that to a wooden board to make it easy to cut. Take out my pizza cutter here. Get my wooden board. Transfer it across and there’s our dinner. We’ll just slice that up, eat that together with spinach salad and a little bit off rocket all mixed in together. You could put some herbs in as well if you like. Together with that I would have a glass of milk. It’s a really good idea for your calcium needs to make sure you have the equivalent of two glasses of milk a day. If you have a problem with the lactose obviously it’s going to be lactose free milk. If you are having some yoghurts somewhere else in the day perhaps with your breakfast or maybe with one of the snacks then I would suggest that you have a pot of the yoghurt and maybe one glass of the milk and that would meet your needs. Now we have had the equivalent of a fruit together with breakfast, you do need to have another fruit somewhere in the day you could have it with one of your snacks or perhaps after dinner and that could be something as simple as a banana for which I am going to grab from here. Make sure that you eat that straight after you’ve had the pizza and salad. That’s because we don’t want a gap of time, we want five small meals a day around about three hours apart and we don’t want snacking in between that. So if you left a gap before having the banana that would be like a snack. After you’ve had your dinner you don’t eat anything more, you drink just water and then your gut will be nice and calm when you go to bed around about three hours later. At least three hours later to make sure that you’re not still digesting while you’re laying down horizontal. Not a great idea at all. I hope that has helped you with just some idea of what a day can look like if you’re on the low FODMAP diet. Obviously there are many variations that can happen here and it depends on your individual needs whether you need to be gluten free, lactose free, you have to be lower in fructose etc. Those things you only find out through doing the elimination stage of the diet and then of course the reintroduction stage to find your major triggers and what you can and can’t put into your meals. Thank you for watching this video and good luck for getting your meals correct, goodbye.